Diva Slicing Cucumber | Henry Field's Seed & Nursery Co. Harvest 5-7 in. 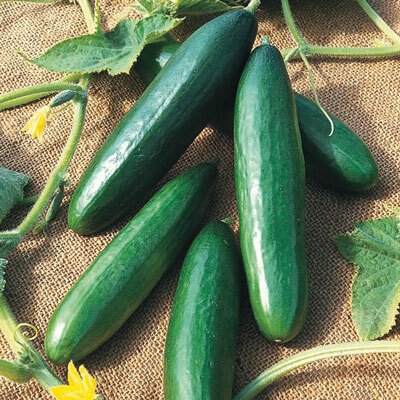 cukes that are deliciously sweet and great for slicing or pickling. Its burpless, bitter-free, seedless fruit with a thin, tender skin is also pest-resistant and will produce heavy yields of fruit—no pollinator needed. It's no wonder Diva is an All-American Selections winner! Foliage is less tempting to cucumber beetles than other varieties. 58 DAYS. Height Vines grow 5-6 feet long. Height: Vines grow 5-6 feet long. Fruit: Dark green, semi-glossy, slender, cylindrical, with slightly tapered ends. Best at 5-7" long.